Wacom Inkling Digital Sketch Pen | OhGizmo! Wacom, makers of the finest PC drawing tablets you can buy, have decided that even their smallest solution, the Bamboo, isn’t small enough for digital artists on the go. So they’ve created the Inkling. 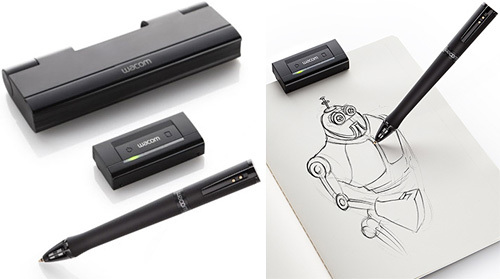 A digital pen that captures your sketches, drawings and presumably even notes, allowing them to be later imported into Photoshop or Illustrator as raster or vector graphics. The fact that it gives you access to your drawings as vector versions is pretty exciting, even letting you separate your artwork into multiple layers while you’re creating it. And while the ability to use it with any kind of paper or notebook is certainly convenient, we’ve found that approach has unique problems of its own. (Read about my issues with the EPOS at the bottom of this review.) But perhaps Wacom has overcome the issues associated with these kinds of sensor + pen capture devices, and maybe the Inkling will be well worth $199.99 when it’s available this October.